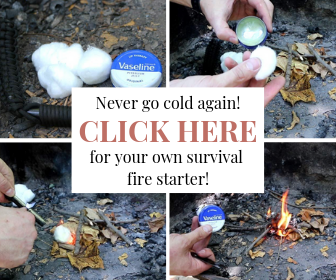 It was about February when, after our hot water tank died in the middle of the year’s biggest cold snap, my husband and I decided to head south. But Where? Well, our only criteria was somewhere warm. When Puerto Vallarta came up again and again as the shortest, cheapest flight list, we booked our tickets and off we went! Here’s the thing. We aren’t really lying on the beach, drinking margaritas kind of people. Aside from the fact that I melt in the sun, just hanging out and relaxing doesn’t seem, well, relaxing. When I travel, I usually want to hike, explore, and learn all I can about the area. While one week isn’t much time, I wanted to make sure that I made the most of it. That can get expensive fast, and the reviews of some of the busiest tours are rampant with complaints from people that felt like they were shuffled through like cattle. Don’t get me wrong – there are advantages to going with a tour. In fact, some of them are even on this list. I just caution against the tours that try to squeeze everything in – at the expense of a quality experience. That might be your thing, but check reviews for tours before you book them to make sure that it’s really what you want. 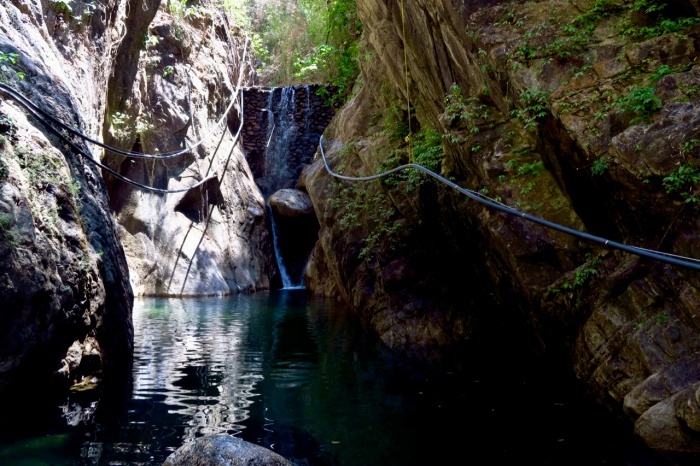 Luckily, Puerto Vallarta is full of fun little places to explore on your own. Also, despite what you might have heard about Mexico, the Puerto Vallarta area is pretty safe. The busses to the north and south of town are cheap and efficient, and the locals are friendly and happy to help you find your way. There are also lots of more personal tours available too. If you think you’ll get sick of Malecon and drinking by the pool, here are a few ideas. Enter Botanical Delights. This is an all-day tour of the Botanical Gardens in Puerto Vallarta or Jardin Botanico Vallarta, a 64-acre expanse of Mexican and international plants including 147 species of orchids, a small vanilla plantation, and some relatively-wild forest. The gardens alone are pretty amazing, but the tour helps put everything in context. It helped turn the visit from an aimless wander around some gardens to a culinary adventure and fun learning experience. 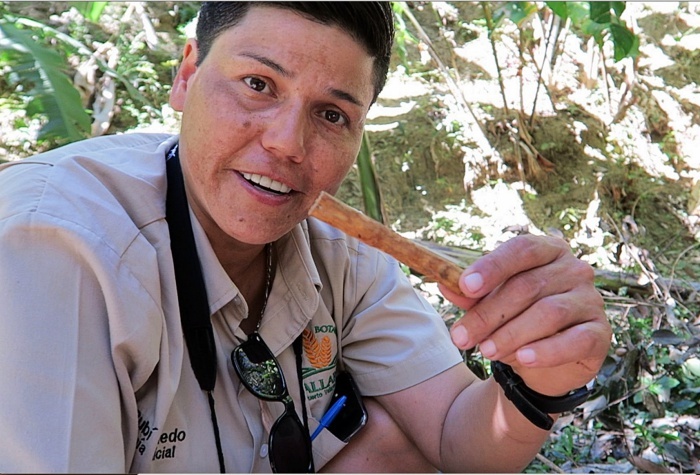 Rubi, our guide, was passionate and knowledgeable about all things nature. She knew her Latin American history and interlaced her history and botany lessons flawlessly. The real win for me on this tour was learning the traditional and modern uses of the plants in the garden, which, much to my delight, included plenty of sampling. Among many other things, we got to try cinnamon, raw coffee beans, cinnamon, cacao, grasshoppers (! ), licorice, and natural chewing gum. Even Clay, who is not a plant nerd or a culinary adventurer, found it fascinating. It all ended in a lunch where we sipped on traditional chocolate drinks and hibiscus drinks along with our traditional Mexican meal and freshly made vanilla ice cream (vanilla grown on site, of course). We also got some free time to explore the longer trails and swim at the river. 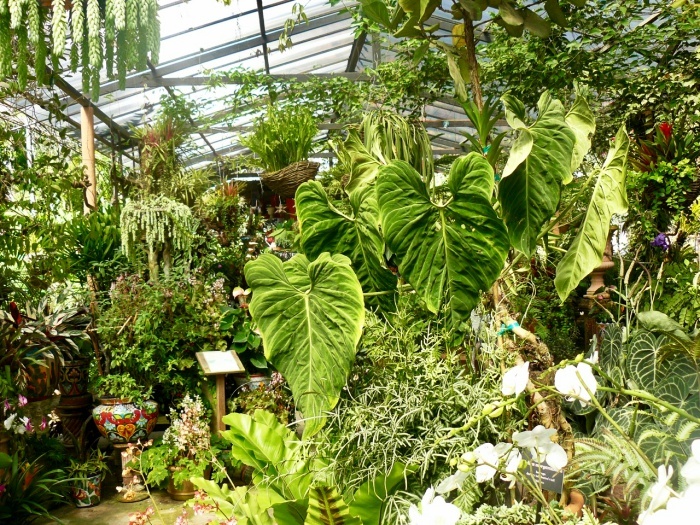 You can get more information on the Botanical Delights Tour here. You can also find their office in the Romantic Zone at Ignacio L. Vallarta 399. You can go to the botanical gardens without a tour. It’s an hour’s bus ride south of town on the bus to El Tuito and costs $1.50 (USD). You can catch it on the corner of Aguacate and Venustiano in the Romantic Zone. It leaves every half hour. Without a guide, you aren’t allowed to touch the plants, so sampling them is certainly out of the question (especially since there are plenty of poisonous plants around). A lot of plants are labeled, but it’s really not the same as getting the stories behind the plants. I’m not always keen on tours, but this one was 100% worth it. 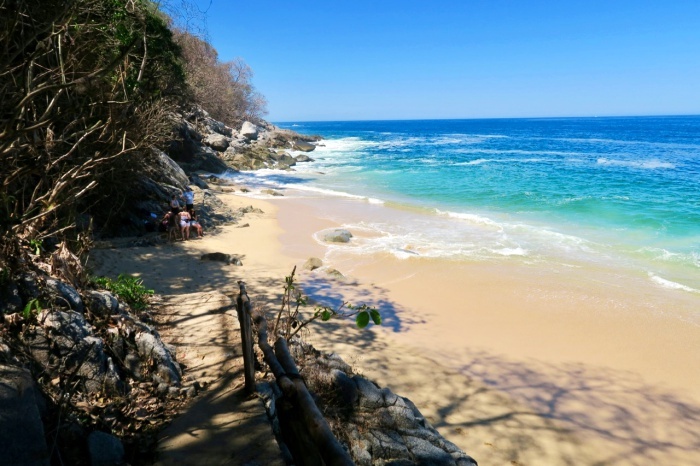 A one and a half hour’s bus ride north of Puerto Vallarta is Sayulita, a small town surrounded by jungle and beaches. With a more relaxed vibe than Vallarta, it’s worth a visit on its own, but for many, surfing is the main attraction. 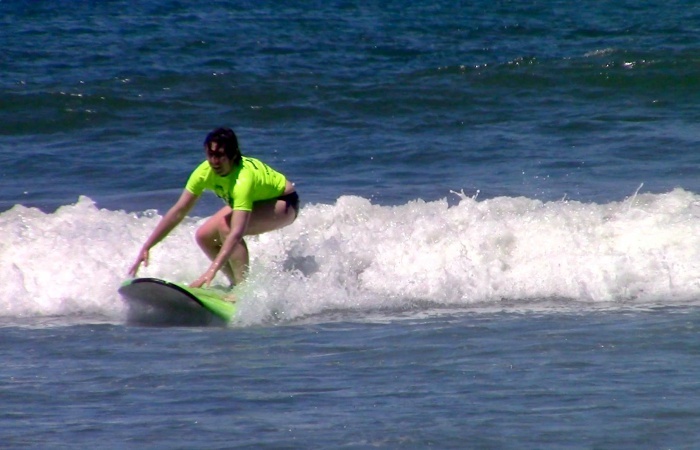 If you know what you’re doing, you can rent a board, don’t (like me) or need a refresher, you can get a lesson. For $40 each (it would have been $60 solo), we got an hour and a half lesson with just the two of us, and an additional hour to play on our own. By the end, we were exhausted but able to catch the slightly bigger waves. Note to the wise (from the unwise): unless you want sitting to become painful for the next week, take a break to sunscreen the backs of your legs and just above your swimsuit where your rash guard might ride up. To get to Sayulita, catch a bus from the bus station at the Walmart north of town. It leaves every 20 minutes and costs around USD$2. Many of the busses that head north from downtown will go by Walmart and will say so on the front of the bus. They cost USD$0.50 and the bus ride takes a little over an hour and a half. There are a number of surf schools with tents along the beach. 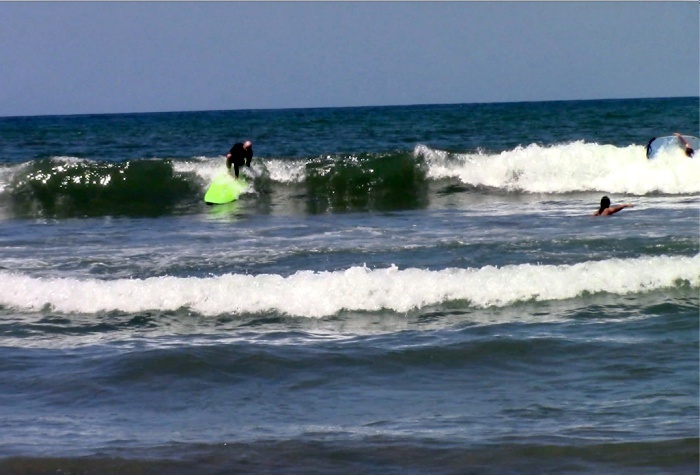 We chose Costeño Surf School because they had time to take us immediately, but there are more, and a quick check of Trip Advisor yields good reviews for all the ones listed. The going rate seemed to be around USD$40 for a group lesson and USD$60 for a private lesson. Our group lesson consisted of just us (lucky, lucky). 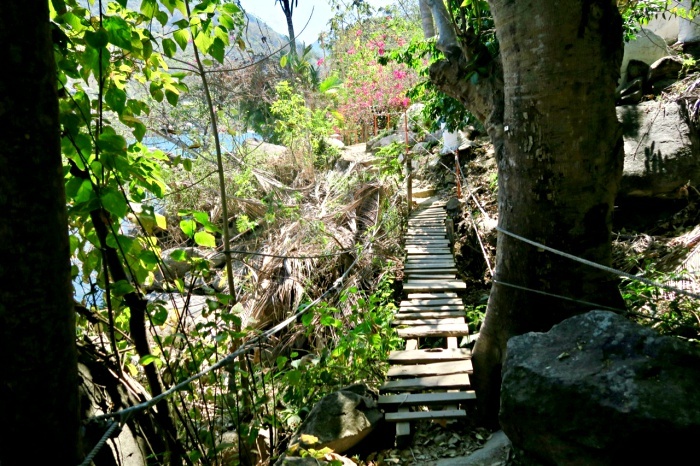 One of the reasons we decided to spend some time in Sayulita was the draw of Monkey Mountain. It’s not a big mountain, but it’s one of the larger accessible hikes in the area. Larger, more difficult hikes seem to be kept as something of a secret by local hikers, which is probably a good thing. Without infrastructure to support a high number of hikers, it’s probably best to leave some of these places off of Instagram. We decided to opt for a guide for monkey mountain. 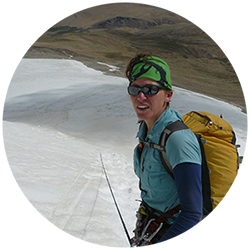 Mexitreks provided a naturalist guide at a fair price. 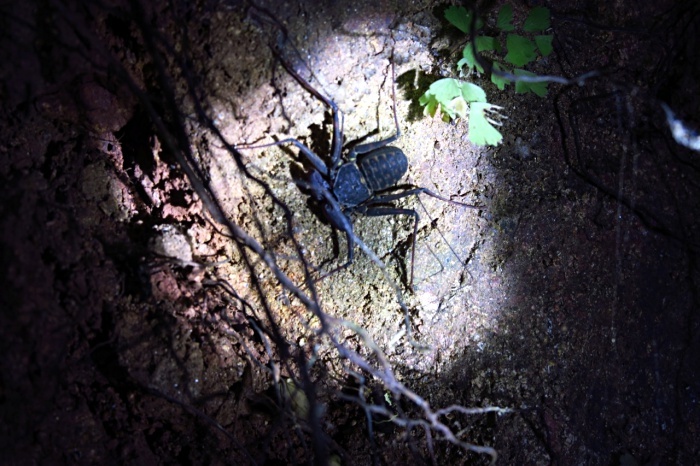 We opted for a sunset tour because the jungle in the night seemed like a great time to see creepy crawlies. The sunset was a draw too, of course. I was not to be disappointed on either point. Yan, our guide, is a biology student and had plenty to tell us and show us about the flora and fauna. My favorite was the bullhorn acacia, which uses its hollow thorns to house and protect the acacia ant. The ants, in turn, protect the tree from termites and fungi. We reached the top just as the sun dipped below the horizon, and in the twilight, Yan highlighted the surrounding geographical features. It appears that Mexitreks operates out of a house – probably one of the reasons for their good prices. Hotels and tour concierges probably sell the tours, but it’s easy to book online. Transportation is provided from Sayulita to all their adventures. They offer a number of hikes and water adventures, all with raving reviews. 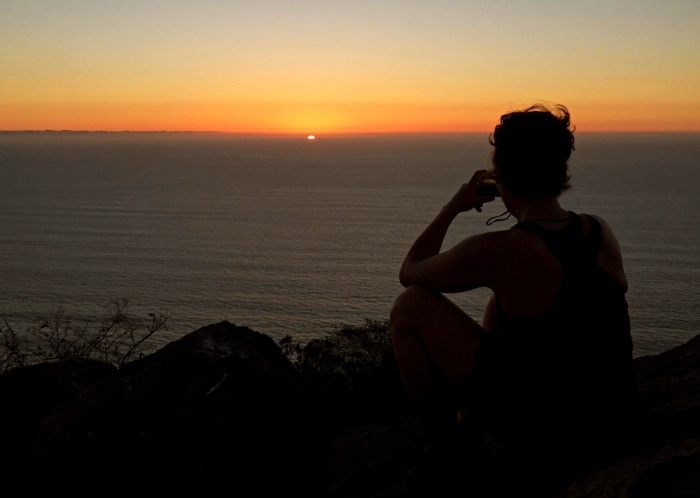 If you aren’t into a sunset hike, they also offer day hike to Monkey Mountain. Could we have done it without a guide? Possibly, though we didn’t see any signs on the route we took. Yan also had to help out a pair of lost hikers on the way down, so the risk is real. We certainly got a good dose of nature knowledge, which in my books, definitely made it worth it. If you’re at all into birds, or simply want to tell your friends how many boobies you saw on your holiday, then the blue-footed booby nests are worth a visit. Incidentally, their two breeding locations, Los Arcos and the Marietas Islands also provide some of PV’s best snorkeling. While you can book an all-day tour to both Marietas Islands or Los Arcos from Puerto Vallarta, you can do it a lot cheaper and quicker by hopping on a bus and heading to Mismaloya, then hiring a small private boat, or Panga, from there. While the most popular snorkeling destination is the Marietas Islands in the north, Los Arcos provides the two things I was hoping for – a reef for snorkeling and blue-footed boobies. 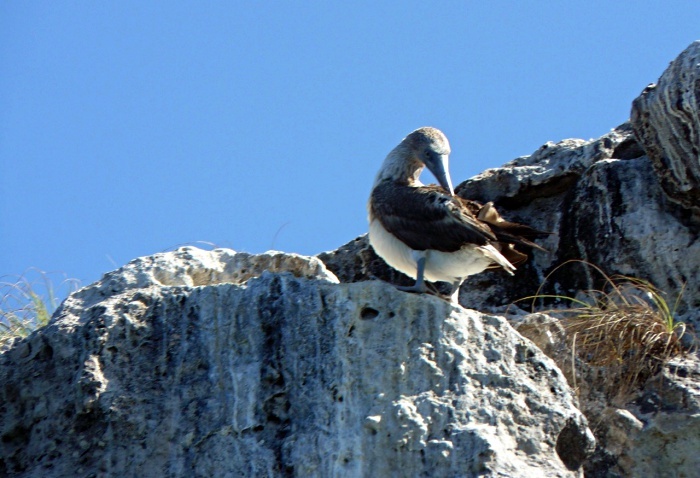 The big difference with the Marietas Islands (which also has blue-footed boobies), is the now famous Hidden Island. Unfortunately, its recent Instagram fame has caused tourist to flock there, degrading the reef. Access is now restricted, and many tours either don’t go there or charge a hefty fee for access. To us, it just wasn’t worth the half-hour visit to a tiny beach. 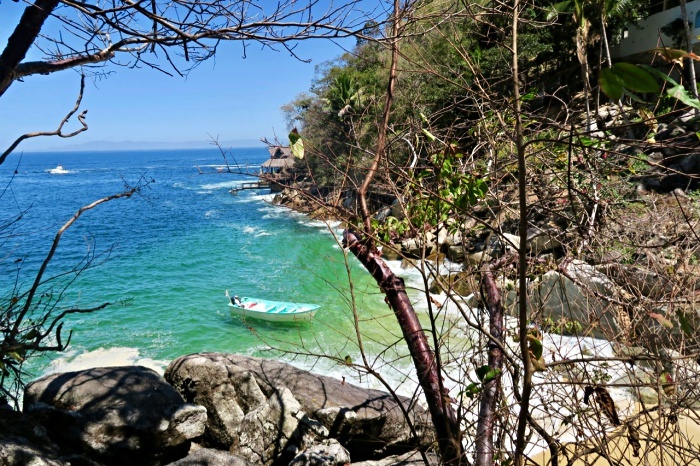 Reading through reviews of cheaper snorkeling tours from Vallarta made the experience sounds like a bit of a nightmare – one that involves a three hour trip to the destination, plenty of seasickness, being left to fend for oneself in rough waters, equipment shortages, obnoxious music, rowdy drunkenness, sexist jokes, money traps, and unfulfilled promises. For $40, we got a one-hour private tour with only a five-minute ride to the site. The small boat got nice and close to the boobies, as well as a nesting colony of brown pelicans. 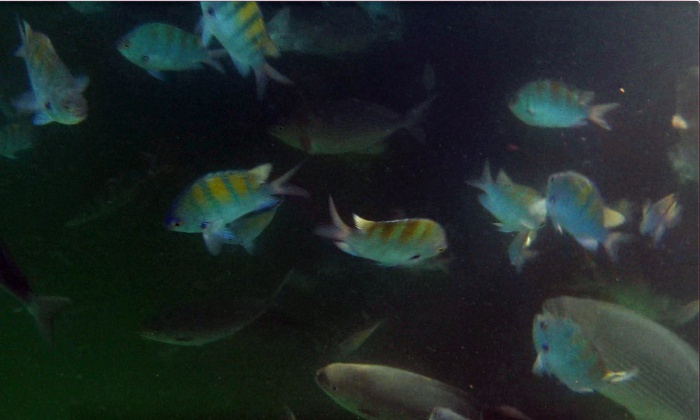 Then we hopped into the water for some snorkeling. When it’s calm, you can swim through one of the arches, but it was pretty rough for us (it’s usually better in the morning, apparently). Clay [Carley’s husband], who was recuperating from Norovirus, got seasick almost immediately. We saw plenty of fish, but the reefs weren’t exactly mind-blowing and we found ourselves getting sloshed around a lot. I finally called it in after getting swept over a reef and missing it by inches (and seeing Clay’s green face) and so we ended our tour early. I’m glad as heck that we were able to return to solid ground rather than spend another four hours on a boat with blaring music and a bunch of drunks. I’m still glad we did it, if only for seeing the boobies – a bucket list item since I was a kid (yes, I was an odd kid). We hopped on the bus to Boca to Tomatlán that leaves from Basilio Badillo and Insurgentes in the Romantic Zone. It cost USD$0.50 and took around half an hour. As we walked into town from the bus stop, we were approached by several panga operators. We paid USD$40 for both of us, but I have a hunch we could have haggled for a lower price since the conditions weren’t ideal and most Pangas were moored at the beach. Some adventurous souls will swim out to Los Arcos from the mainland, but even in calm conditions, it’s a long way with a fair amount of boat traffic. The Devil’s Canyon on the north side can have a strong current and has claimed a few diver’s lives. Seems like a good reason to just get a boat. Mismaloya is actually the place that put Puerto Vallarta on the map with the 1964 film, Night of the Iguana. It’s a cute little town with a nice beach and decent restaurants. It’s worth a couple of hours to eat, relax, and walk out to the point where the movie was filmed. Of all the activities I was looking forward to on our trip, Palo Maria topped the list. I love creek walking. 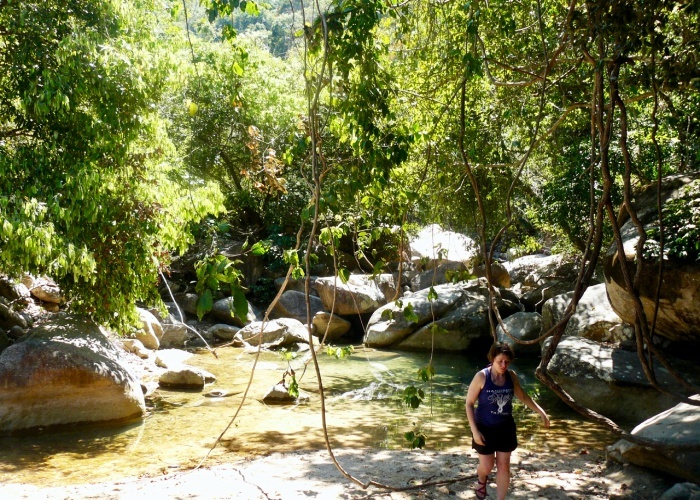 Throw in a jungle and a beautiful swimming hole, and you have the recipe for the perfect adventure. Even more enticing was the promise of the much less explored waterfalls above the main waterfall, accessible only by a steep scramble. Unfortunately, I had spent the night before vomiting, and Clay was on the mend from a bad bout of Norovirus. We were underfed and dehydrated, but with time running out before the end of the trip, we still decided to do the hike. Walking to the first waterfall took around 45 minutes, but it could probably be done in less time by someone in better health. As we approached the first falls, it was obvious that Palo Maria was no secret – there were at least 30 people crowded around the small pool. Luckily within a few minutes, a tour group cleared out, leaving mostly local teenagers. Doing the hike on a weekday would probably make for a quieter experience. The swimming hole at the base of the falls was beautiful and refreshing. There was a small cliff jump off to the side. The climb to the top had a questionable fixed cable and looked doable – maybe an easy class three scramble. We saw a party of four go up without much trouble. While we felt refreshed after the swim, we remembered how bad we’d felt on the walk in. Get to Palo Maria on the bus to Boca de Tomatlan (the same one that goes through Mismaloya). The stop is a few minutes before Mismaloya. 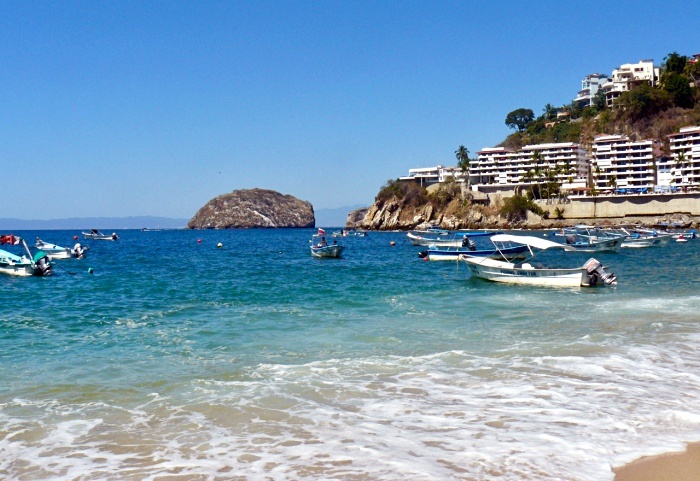 Watch out for the sign to Palo Maria Beach and Garza Blanca Hotel. Get off the bus, cross the street, walk about 50 meters north to the river and start walking up it. For the easiest walk, stick to the fence on the right-hand side. Wear running shoes or sports sandals, and bring water and a swimsuit. If you are planning on going beyond, definitely back some snacks and whatever you’d usually bring for a longer hike. Some people have managed to keep walking for around three hours before the obstacles got too tricky. This hike is definitely a widely known one. Leaving from Boca to Tomatlán, there are two main destinations, a small beach tucked into a cove or Las Ánimas, a busyish beach accessed only by boat or foot. While Colomitos was a nice little beach, and only a half hour walk from Boca, it was also busy. Though there were plenty of people continuing on like us, we soon realized that they were all booking it for Las Ánimas without stopping at the other beaches. With restaurants and hawkers, and plenty of boat traffic, Las Ánimas was of little interest to us, so we decided to walk until we found somewhere we liked. We found a shady spot at Playa Escondida, only ten minutes beyond Colomitos and, with the exception of people passing by, had the beach to ourselves for a good chunk of the time. Any question of going further was answered when I stepped on a stump on the beach and got an ugly looking gash on my foot. I opted to hobble back to Boca and Clay followed. Hiking to Las Animas would have taken a total of two hours. The path starts in Boca de Tomatlen. Catch the same bus as you did to Palo Maria and Mismaloya, but don’t get off until the end – around a 40-minute ride. Once in Boca, wade across the river and follow the path along the ocean. The trail is well maintained and clearly signed. It follows the seaside for the first part before heading up into the jungle. There is a lot of up and down, with a few roots and rocks to stumble on, but it’s a pretty easy hike for an experienced hiker. 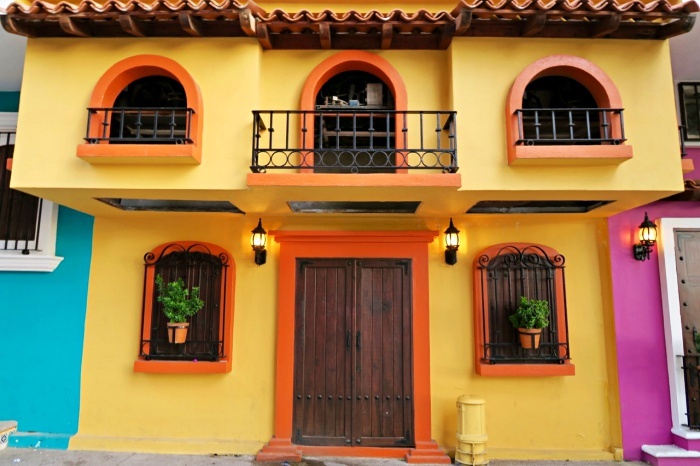 It’s a half hour walk to Colomitos and a two-hour walk to Las Ánimas. If you decide you don’t want to walk back from either Colomitos or Los Ánimas, you can catch a water taxi back. Some people were doing it in flip flops, which seemed like a recipe for stubbed toes and twisted ankles. I walked in my sports sandals, which would have been fine if I wasn’t trying to keep sand out of a wound on the hike back. Close-toed shoes with a good tread are definitely the best option. Find a local to talk to. We met Rubi, our Botanical Delights guide, early in our trip and got some good pointers on things to skip and ways to save money. There are also lots of expats who are happy to share some of their favorite places in PV. Leave time for flexibility in your schedule. We had a few ideas, but after talking to some locals and expats, we altered our plans. Our sickness also meant doing less of what we wanted to do. If we had booked too much ahead of time, we might have been out a lot of money. Stay in town. A lot of the resorts are sort of out of the way. It might be nice to be right on the beach in the Hotel Zone, but it’s also nice to be close to cheap restaurants and busses. The Old Town has a lot more character too. Check reviews before booking tours and hotels. There are some great places and some not so great places. Don’t let other people dictate your travel style. That includes me. If you want to go on booze cruisers or lounge by the pool, don’t feel like you need to spend your time hiking just because some blog posts say so. 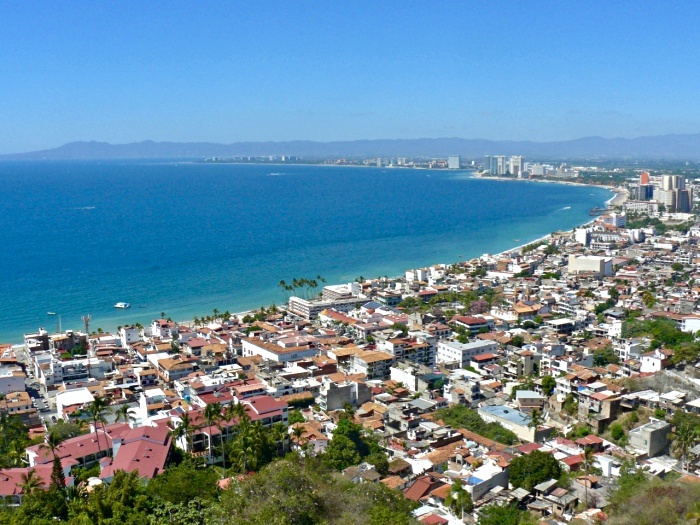 Puerto Vallarta is a great place for a vacation, whether you want to squeeze everything in, relax on the beach, or hit the clubs. If you are like most vacationers, you probably have less than two weeks, so use that time wisely and do what YOU want to do. Have FUN and Enjoy Your Holiday! I love your reviews and great tips, Carley!